I like to use a lot of Georgia natives in my plantings when I can. Among them are our violets. 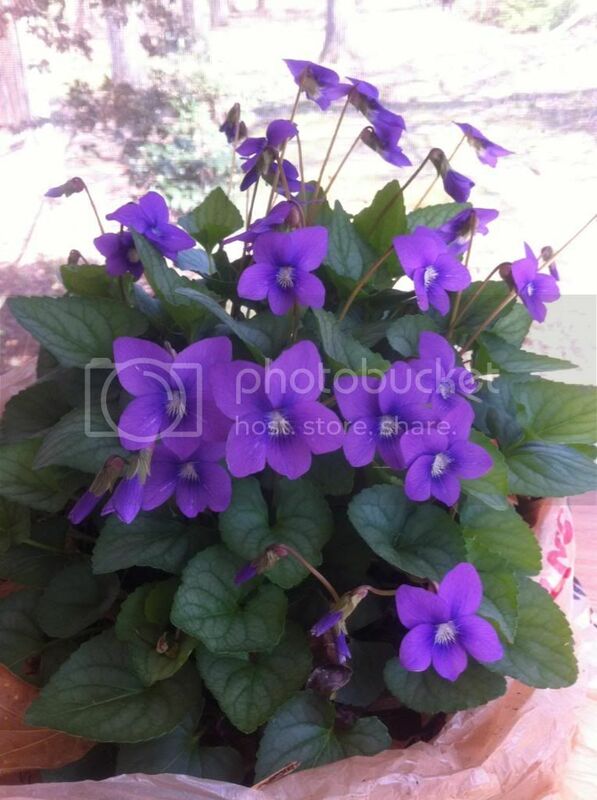 I have birds foot and sweet violets but one of my favorites is this one, the Southern Woodland Violet. It grows around here in the woods and has dark leaves, more narrow than the sweet violet, that is overlaid with a silvery lacework like a deadnettle - but more subdued as the plant comes up and the leaves darken slightly. 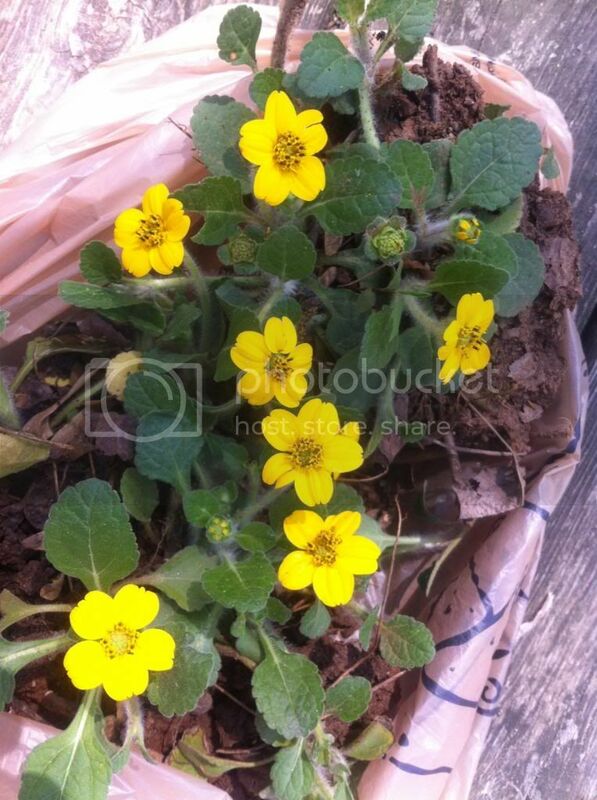 As you can see, this volunteer I dug up in my horse pasture is full of large, cheerful flowers. The colors range from pale blue to deep reddish purple on my property. Be careful where you put these or sweet violets though as they love to spread wildly by seeds. Great for shady low moisture areas and along walkways, but I don't reccomend them in your planted flower beds or pots where they might overwhelm your other plants. Another one I just dug up out of the same wooded section of horse pasture was along a dry creek bed is seasonally wet here. It is Chrysogonum Virginianum also known as 'green and gold' among other names. A small, low growing but very cheerful little plant! Does fine in deep or light shade as long as it has plenty of moisture. I like to plant it where my ferns get a little dripping from a leaky downspout and it spreads into a nice little carpet. Very pretty! I have tried to grow the green-and-gold in my native woodland shade plants garden, but it is one of the many woodland plants that needs acidic soil and mine is just too alkaline. Very nice for you that you can grow it! So pretty! The violets are pretty, but can get a bit pesky in places. One of my faves is starting to bloom now, Woodland Phlox. It does very well in light shade, can be ignored, spreads but not invasive. It is native to SE and perhaps wider area as well. Hah! Soil acidity here is not a problem - except in the /other/ direction of too low a PH. In my case I mix in a lot of wood ashes and some lime into my vegetable garden soil. In your case, if you drink coffee or tea (I drink both) you can save your tea bags and grounds to sprinkle into an small designated area. As it happens, it also drives out snails and slugs which can't abide caffiene, or so I read. Pine needle mulch (and mixing in plenty of rotted compost or peat) can do wonders to make you a nice acidic bed even in very alkaline soil. As long as you continue to dump your coffee and tea leavings there and dress with an acidic mulch like pine needles, I think you could easily achieve a mico-nitche to grow some things your neighbors don't have! I've had great success doing this for some of my native orchids (obtained through Georgia Native Plant Society rescues) when I lived elsewhere. They can be so fussy with their fungal relationships! I love woodland phlox. I first encountered it on hikes up in the mountains and one cabin we used to live in at around 4,000 feet had it /everywhere/! I brought some of it with me when I moved and I have kept it going ever since. I wish I had thought to collect some foam flower as well. viewtopic.php?f=31&t=57351 (scroll down to my second post on that thread). Hmm... From what you are discussing, I should be able to grow green and gold. I think I relied too much on their supposed drought tolerance. Plus I didn't count on the area getting buried in wind drifted deep piles of fall leaves. I'll have to find a better spot for them and try again. I'm so looking forward to seeing more photos as the season progresses. It would be interesting to compare with rainbowgardener's Ohio (what region is the area grouped as?) woodland shade garden now that she's posting photos again. I don't have a very extensive shade garden since mine was nearly wiped out a couple of years ago... They *were* staging a comeback, but ... I think some things didn't survive this past winter so it will be a season of discovery. I think mine would be mid-Atlantic to northeast. Hmmm, until you are able to replenish your perennials a few at a time you could pick up some impatiens and shade begonias. I have fantastic success with taking cuttings from these that allows me to go from a few plants to several flats in a matter of a few weeks. I always over winter a few in pots for fresh cutting material. My impatiens also tend to throw seed that comes up the following year in scattered areas, but then my winters are usually rather mild. I also have good success with hostas from seed, columbine, fox glove, and many others for shady areas. If you have a local Native Plant Society, they are a wonderful resource! If you join (it's cheap) you can sign up for plant rescues of native plants in your area - many of which will be shade loving. Places that are going to be developed are asked if the Society has permission to collect plant material to rescue it. I have obtained hundreds of lady slipper orchids and many variety of native perennials and trees this way to transplant to my property, or the the properties of friends. And they'll teach you what you need to know to help you keep them happy. The plants are free and in this way it's also legal to collect them. In your case, if you drink coffee or tea (I drink both) you can save your tea bags and grounds to sprinkle into an small designated area. As it happens, it also drives out snails and slugs which can't abide caffiene, or so I read. Pine needle mulch (and mixing in plenty of rotted compost or peat) can do wonders to make you a nice acidic bed even in very alkaline soil. As long as you continue to dump your coffee and tea leavings there and dress with an acidic mulch like pine needles, I think you could easily achieve a mico-nitche to grow some things your neighbors don't have! I have tried acidifying the soil in order to grow some of the acid lovers. Works for a little while. It might work longer, if I could be more diligent about keeping on replenishing the acid. But we are talking roughly 6500 sq feet (very roughly 35 x 185') of very steep wooded hillside, with just a home made rudimentary path, which so far doesn't make it all the way down. Especially the back part is quite remote and adventurous to get to, so I am not going to do very much to it. Under the circumstances I can keep acid lovers alive but not thriving for awhile but they always end up dying out. Best to plant what likes to grow in the soil I have. Yes, that is the point of growing natives, to grow what works best in your area! Still, when I used to garden back in Indiana where I originally grew up, we had a lot of limestone so I feel you. I found making a raised bed using a heavy dose of peat moss was the trick so I could /also/ have a specialized acid bed for planting more variety. It didn't require constant replenishment with acids since it didn't have a high dosage of native soil in it to begin with. Alternatively a large bin, or boxed bed on a deck would work. Obviously it depends on what you want to try with your gardening. I am not condoning starting a fight with a large natural area to try and get things to grow that weren't suited. I don't think that's wise. There are so many wonderful local natives to explore to bother with that. Blood root is a plant to add for the native shady area. The white star bloom is brief in spring and so pretty (mine over) then has a flat umbrella leaf. It often goes down in heat of summer, so do mark area with something! Ornery - I found lots of information on landscaping with native plants - Georgia specific. Too many to read through them all and repeat the information so I will paste a couple of useful links. There is contact information on this link that you may want to investigate. I found other links with Georgia specific information that I will add. There are pages of publications put out by UGA AgCenter. Many specifically address landscaping with native plants. I like Land Grant University publications because the information is region specific. Other than searching for and digging up native plants you may want to use the contact information in the first link for available resources. Please keep us posted on your progress. I am anxious to see what you come up with. I'm a past member of the Georgia Native Plant Society so that's a great resource out here for me as well. They do lots of plant rescues and re-locations and are who got me interested in using natives in my garden years ago. If I lived closer to Atlanta, I'd still be an active member. I assume other states have their own versions of the same sort of thing. I used to have blood root - I love it, but I lost mine to bad drought two years ago. I assure you that I do not go around illegally collecting wild plants - many of them are protected. I've only done it when I have wanted a small bit from good sized colonies on my own land, especially in threatened locations where the bank is washing out or the fence has to be ripped out and replaced, or drainage has to be dug, etc. Or if I go on a plant rescue for an area about to be developed. Otherwise I have a pretty good local resource right in Athens for native plants I can buy at reasonable prices that are not wild collected.